By 2002 the genre was once again thought to be dead by mainstream Hollywood but guess what? Remakes! Bloody, freaking remakes, bringing the genre back to life once again. So you get the drill, nothing is really dead unless you see that body being cremated! Otherwise, Waaaaaaazzzzzzzuuuuup! Oops, my mistake! Same mask, different film! The slasher genre refuses to die unlike their victims, and for fans like myself, I’m very glad that’s the case. 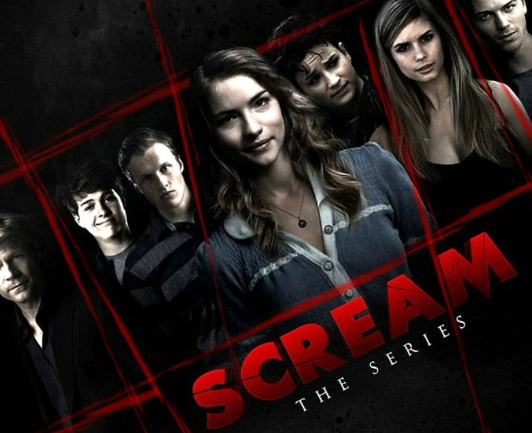 As John Karna’s character Noah Foster says in Scream – The TV Series: “You can’t do a slasher as a TV series… Horror movies burn bright and fast.” but it looks like MTV and producers Bob and Harvey Weinstein decided to take on the challenge by adapting the show from the original Scream films created by Kevin Williamson. The film of the same name. So the big question is: Should slasher fans watch Scream: The TV Series? Well, if you are a fan of the genre and the original franchise, it’s definitely worth a go! The TV Series begins in typical slasher fashion with the murder of the popular mean girl Nina Patterson, played by the stunning Bella Thorne. After posting a video on Youtube shaming her classmate Audrey Jensen, Nina is alone in her mansion when The Killer impersonates her boyfriend Tyler O’Neill, by texting her with his phone. While relaxing in her hot tub, Tyler’s severed head is thrown into the tub. Nina runs trying to call 911 but The Killer slashes her anyway. Ding, Dong the B*tch is dead! The show conveys other typical premises of the slasher genre, for example the fact that the plot is influenced by a past mistake of a young character. In this case, it’s the story of Brandon James from 20 years ago. Our insufferable know-it-all Noah is the one who tells the story “He was a classic case of the deformed kid who lived in the shed… Whenever he went out, he wore this post-op surgical mask.” Mask? Is he the new Ghostface? The rumour was that Brandon James fell in love and got obsessed about a girl name Daisy. He got up the nerve to finally talk to her at the Halloween dance, it was going well until a bunch of drunk jocks beat him up thinking that they were saving her. Brandon snapped and killed five students, and the manhunt finished by the pier where Daisy secretly agreed to meet him but the cops shot him instead. In typical fashion The Killer uses unconventional weapons and ways to kill their victims, which are pretty awesome – if you are a sick as me. There is no point of being categorised as a slasher if there is no slashing, as Paddy McGuiness would say: ‘No Slashing, No Likey’! Thankfully the show does deliver this in spades. One of the things that made Scream so popular in 1996 was that the victims were aware of the horror film conventions/cliches, using them into their advantage, which also added an extra layer of humour into the films. In the show, our horror film expert is Noah Foster. He is probably my favourite character because of his vast knowledge of horror films and serial killers. He is effectively their Hermione. His self-awareness of these horror cliches is what helps some of them to survive, while also making it extremely funny. A lot happens in the first season of Scream: The TV Series, teenage drama, brutal slayings and lots of family secrets come to life. In all honesty, if you do truly enjoy the slasher genre, Scream: The TV Series is well worth a watch. It’s a twist of the original franchise with the added bonus of cyber stalking due to the advance of technology. So if you love slashers and haven’t watched Scream: The TV Series, there is something really wrong with you. However, you should head over to Netflix and binge watch the whole first season there, as the second season has already started, and OMG, you won’t be disappointed. Scream shows on MTV for US viewiers or Netflix for those in the UK. The last little piece I wrote for Let’s Watch Telly blog is Slashing…I mean Smashing! A little mild spoiler review of the first season of Scream: The TV Series. Go have a little read, if you dare.